There is a vast range of exotic holiday destinations in China of this New Year season. Let’s see something special for the coming 2012! Prepare for the spring festival by planning all out what to do and what to enjoy. In China, you will explore the cultural traditions of the oldest living civilization, take a break and appreciate stunning natural winter spots. From the icy winter wonderland in Harbin, to the tropical blue water’s and beautiful palm filled beaches of Sanya, check out the best places to ring in the 2012 Dragon New Year! Harbin — Ice and Snow There is no surprise that this famous Northeast city is the champion of winter holiday resorts. When you hear St. Sofia Church, Central Street, Northeast Tiger Park and Yabuli Ski Resort, your mind immediately fills with images of a winter wonderland. The spectacular scenery and Euro-Asian architecture found in Harbin has contributed to the city being labeled the ‘Oriental Moscow’ which make this amazing city a must see destination. Come and head north into the icy cold paradise and take in the magical atmosphere while ringing in the 2012 Dragon New Year! While visiting Harbin you will have the opportunity to explore the dazzling ice sculptures on display for the Ice Festival. Unprecedented! In Harbin, there are the exquisite ice lanterns, snow sculptures and fashionable shopping malls. If the icy cold weather becomes immobilizing, you can go to some local hotspots famous for delicious ‘melt in your mouth’ delicacies which are filled with Northeast flavor. Are you frustrated by the cold winter weather and long for a warm and relaxing escape to sea side’s golden beaches? Then look no further than Sanya! 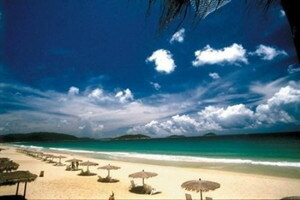 This tropical paradise is continually voted as having the finest beaches in Southern China. For a romantic getaway head to Yalong Bay and Dadonghai Resort, the amorous atmosphere stimulates magical fairytales and memorable experiences! You will have the opportunity to swim in the clear blue water filled with tropical fish, or stroll along the enchanted beaches, or simply sit back and soak up the sunshine. When the sky is that blue and water is super clear, who is not going to enjoy the sunning climate and scenery? Get up and let’s go! Brace the sky and let’s swim! Experience some of China’s exceptional beach resorts and China acticities! This opportunity is not to be missed! Located in Southern China in Guangxi province, Gulin and Yangshuo are great places to escape from the hustle and bustle of everyday life. Guangxi is famous for its laissez-faire ambiance; the beautiful scenery and numerous historic attractions draw domestic and foreign visitors annually to explore this delightful province. The breathtaking scenery along the Li River displays some of China’s ancient and beautiful limestone hills which surround Yangshuo and the Li River. The phenomenal ancient mountains possess a mystic which affects all who visit this amazing town. A variety of these hills are believed to look like people or pieces of art work, the ethereal beauty of the landscape is guaranteed to astonish. One famous hill is called School Hill or Shutong Hill, and if you get close enough you will be able to recognize the figure of a boy. 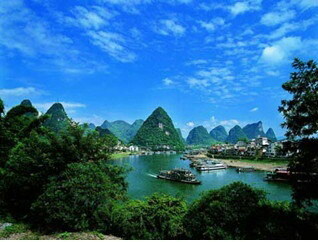 Guilin and Yangshuo are a dream for any traveler, as the versatility of options available will satisfy any tourists. The nightlife and restaurant selections are limitless; moreover Global Village in West Street has an amazing array of shopping alternatives. If you feel like being one with nature then head out to Elephant Truck Hill and Pagoda Hill to explore the fascinating history of this beautiful location. If you’re contemplating a winter adventure to Xi’an, be sure to pack your swimming togs as the mystical beauty of the Huaqing Hot Springs is a requirement for any trip to Xian. The Huaqing Hot Springs have remained a significant enticement for all visitors throughout the years. The layout of the Huaqing Hot Spring fascinate all who visit; the vibrant gardens and old cedars trees planted alongside the Nine-Dragon Lake are simply divine. The clear sweet water of the lake ensnares all who look below the glossy surface, its mirror like characteristics reflect heavenly delineations. Furthermore Xian is filled with an ecliptic mixture ancient Tang style and modern architecture. The historic Wild Goose Pagodas are impressive examples of ancient designs which are bound to captivate all who visit. The astonishing Terra Cotta Warriors and Horses are an extraordinary collection of life-size figurines’, each with their own facial expressions, hairstyles and uniforms which fascinate all who visit. If you’re contemplating visiting Huashan Mountains, it is best to go in the early hours of the morning to watch the sunrise, as the first rays of light illuminate the rugged mountain peaks you will be mesmerized by the mountains beauty. 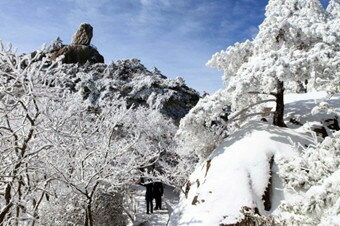 Huangshan Mountains —No need to see any other mountains after it! Many people recommend going to Huangshan Mountains in winter rather than the humid summer heat, as the amazing icy winter scenery is guaranteed to dazzle. As one of the most popular tourist destinations in China, Huangshan Mountains are best known for its divine sunsets and picturesque rugged peaks. In winter, the glittering snow casts a spell over the mountain and turns it into a magical winter wonderland. The stunning natural beauty is bound to enthrall, the crystalline waterfalls, seas of clouds, and uniquely shaped pines set against a backdrop of impressive jagged rocks make Huangshan Mountains a must see destination. The exquisiteness landscape has driven many throughout history to replicate the Mountains atmosphere in paint and prose; moreover it was used as the filming location for the Oscar-winning movie ‘Avatar’. This Planet The intoxicating beauty of West Lake casts an enchanting spell over all who visit, as its dreamlike beauty induces euphoric responses. The inspiring splendor of the West Lake has led many to try and encapsulate the Lakes essence in numerous poems, paintings, and historical accounts of Hangzhou. In winter, clusters of red plum blossoms are glossed in crystal white snow providing the lake with an ethereal ambience. The stunning scenery has generated the proverb “Heaven is for the sky and Hangzhou for the earth”. When the well-known traveller Marco Polo visited the city, he exclaimed that it was “the most beautiful and richest city in the world”. See! The twilight is so nice, it will be great to come and visit this charming city. 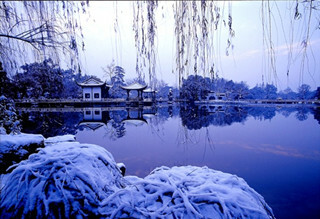 Explore the West Lake beauty in winter with a peaceful and romantic atmosphere reminiscent ancient times. No journey in China is complete without a visit to the nation’s ancient capital Beijing. The extensive antique monuments and convoluted history of Beijing provide a fascinating base to explore the city’s ancient sites. The vast array of historical sites to explore appear limitless; from the Tiananmen Square to the Forbidden City, the Summer Palace, to the Temple of Heaven or The Great Wall of China each location is surrounded by ancient traditions and fascinating historic legends. Though you may have previously lived in or visited Beijing, you may be unaware of the enchanting history that surrounds the nation’s capital. Beijing the city that never sleeps is filled with energy and excitement which enthralls all visitors from around the globe. 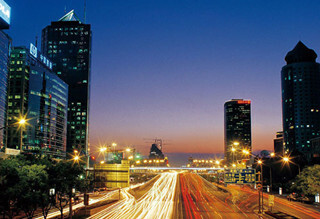 Beijing has many bar and restaurants on offer, however the most famous bar streets are known as Sanlitun and Houhai. If you’re looking for some excitement and the desire to paint the town red, look no further, this is the place to get your groove on!